There’s something about summer that raises the spirits. From the sun on our skin to splashing in the surf, summer spells smiles. However, summer is also a time of additional health hazards for pets and their under-prepared owners. How many of the following summer health hazards are you aware of? What could be more fun on a summer evening than relaxing with friends at a BBQ? Burns: Gulping down a hot baked potato not only burns the mouth but the gullet (esophagus) which can result in nasty internal burns which scar over and cause long-term problems with swallowing. Foreign Bodies: Hastily gobbled foods such as corn cobs, when the swallowed whole can easily form a bowel obstruction. Shoving down a skewer left by mistake on the grass can seriously injure the intestines. These situations can be life-threatening and require emergency surgery to remove. Pancreatitis: Burgers and sausages are often high fat and a trigger for pancreatitis in some dogs. Tummy Upsets: A smorgasbord of foods that the dog isn’t used to usually adds up to an upset stomach, vomiting, and diarrhea. And be sure to keep alcoholic drinks and marijuana well out of paw’s reach, as dogs have a very low tolerance for these substances. Imagine emerging from a humid wood into a clearing where a shimmering lake beckons. What could be more inviting than a cooling splash in the water? Unfortunately, if that water contains blue-green algae then this could mean a very sick dog indeed. Blooms of blue-green algae are made up of cyanobacteria. These produce a natural toxin which causes liver and/or nerve damage. In a worst-case scenario gulping down water contaminated with blue-green algae can produce convulsions in as a little as 15 minutes. If you are concerned about blue-green algae poisoning contact a vet ASAP. Too hot to walk on the pavement? If you’re reaching for flip-flops at the beach because the sand is too hot then know the ground is too hot for your dog as well. Likewise, avoid sidewalks that are hot enough to fry an egg on. If you can’t hold your hand on the ground for more than 5 seconds then this is a burn hazard for your dog’s feet. Exercise in the cool of the day and stick to the shade. Nobody ever means to kill their dog by leaving him in a car on a summer’s day… but it still happens. Quite simply it’s all too easy to underestimate just how quickly temperatures climb inside the glass box that is a car. The only safe option is never to leave a dog in a car unattended. Simply don’t take the risk. If the dog can’t go with you into a store then leave him at home. When your pet pal wears a fur-onesie and doesn’t sweat, overheating is an all too real possibility. The dog’s coping mechanism is to pant in order to cool off. But those dogs with flat-faces, such as pugs, Frenchies, and bulldogs, already struggle to breathe, which places them at a disadvantage when keeping cool. Always limit activity in the hot hours of the day and take water with you on walks. Do not try to push your dog and stop regularly to let him cool down. If he’s lagging behind or keeps lying down, then get him in the shade until he recovers. If necessary, offer water then carry the dog to a cool place to seek help for heat stroke. When having fun at the beach it’s easy to overlook how salty the sea is. If your dog drinks from the sea he could be in danger of salt toxicity. Be sure to take plenty of freshwaters and at regular intervals encourage your dog to drink. Just like people, some dogs are at risk of skin cancer with chronic UV exposure. Those most at risk are white coated dogs or those that lack pigment, such as having pink noses. Repeated sun exposure over the years can cause cancerous changes in the skin. Indeed, there have been cases where piebald dogs developed skin cancer only on the white areas, but not the brown! 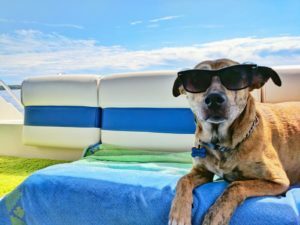 Key to prevention is reducing sun exposure (provide shade, especially for outdoor dogs) and using sunscreen to avoid sunburn…which brings us to the next hazard. Areas which have thin hair and black pigments such as noses, eyelids, and ears are most at risk. Indeed, any dog with a thin coat where the skin of the body is visible is potentially at risk of sunburn. The golden rule is that if you would burn then so will the dog. Sensible precautions include sticking to the shade and exercising at dawn or dusk. However, there are also special pet-friendly sunscreens available. Be aware that many human sunscreens are not suitable for dogs because of the zinc content. Quite simply we humans aren’t in the habit of licking off sunscreen and so ingesting zinc is not a risk. The same isn’t true for dogs and overtime toxicity can occur…so chose a pet-friendly product (zinc-free). Summer is peak season for many snakes, especially in spring and early summer, after their winter hibernation. Those dogs most at risk are the nosy ones who like to sniff and explore undergrowth. Be aware of what native snakes are found in your area so that if the worst happens and the dog is bitten, you have an idea of whether the snake is venomous or not. In places where the risk of encountering a snake is high, keep your dog on the leash to prevent him roaming. Also, be aware of what to do (and what NOT to do) in the event of a snake bite. From ticks to fleas and sandflies, summer is peak season for parasites. Whilst some parasites merely cause irritation, others can carry serious diseases such as heartworm, Lyme disease, Leishmaniosis, Babesiosis, and Ehrlichiosis. Prevention is better than cure, so be conscientious about using a preventative product regularly (at the interval advised by the manufacturer). In addition, check your dog at the end of each day for ticks in particular. Removing ticks promptly, before they have been attached for 24 hours, can prevent the transmission of some serious diseases. If all of a sudden summer doesn’t seem such a rosy prospect, don’t worry. Knowledge is a powerful thing and being aware of the hazards is half the problem solved. As for the rest, when your dog wears a PetPace collar it’s super-easy to spot a climbing temperature or racing heart, which can be early warning signs of trouble. Simply recognizing your pet is struggling in the heat may be all that’s required to step into the shade and divert disaster! So enjoy the summer but be sensible for the sake of your dog’s health.